My experience building a website using Wix. Wix is a heavyweight in the site builder market with 3.4 million paying customers with websites. It is also an innovator when it comes to extending the functionality of sites beyond a typical small business website with a product it calls Wix Code. The typical Wix user will begin with the company’s “Artificial Design Intelligence” system. That’s marketing-speak for a system that takes user-defined inputs and spits out a basic website based on those choices. For example, what is the topic of your website? Do you want a site that’s fancy or contemporary? Although it’s far from artificial intelligence, it’s a decent launchpad for a website. My goal with Wix wasn’t so much on the design side. Like Squarespace, it’s easy to create a site and edit the design. Instead, I wanted to test its Wix Code functionality, especially as it relates to databases and dynamic pages. The promise is that it makes dynamic and database-drive sites easier to create. 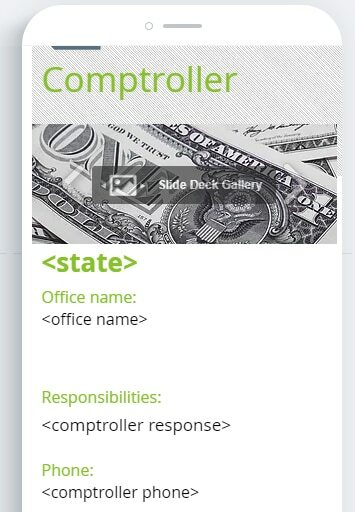 To test Wix code, I decided to rebuild my comptroller website that I haven’t touched in nearly a decade. It was built with a now-defunct website builder and was in serious need of updating. It still gets traffic and earns about $20 a month on Adsense, but the data was out-of-date. This site is essentially a state-by-state guide to comptrollers in states which have a public official or office of that title. Each page of the site contains the same type of information, which makes it perfect for Wix’s database collections and dynamic pages. As an example, here’s a page for the Texas Comptroller. Although I have a page like this for 17 states, I only had to create one template. 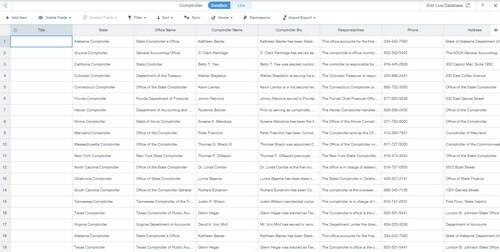 The data is pulled from a database to create each page. Then I created hooks for each of these fields in my template. The process of adding hooks was a bit disappointing. I thought I’d be able to just insert tokens where I wanted the database information inserted. since the corresponding field in the database is called office name. This would allow me to create one text box and pull in all of the data for the content section of the page. 1. Because each block is drag-and-drop and can be placed anywhere, there’s some seriously bloated HTML on my pages. 2. It’s not as intuitive for mobile conversion, especially if data elements are placed side-by-side. I had to change the design to work better on mobile. Even then, some elements had to be shifted on the mobile editor. That was a tedious process. Creating menus containing links to each dynamic page wasn’t intuitive, either. I think Wix could be extremely powerful for non-coders to create database-driven sites, but the process will need to be easier. Wix offers a lot of apps that can be “installed” on your site. The one I installed was Adsense, and it falls quite short. It only lets you select from a few ad sizes and the app has to be installed for each individual ad. I had difficulty installing more than one ad per page. Google Auto Ads seems to work if you put the code in the header, which is designed to allow you to play analytics code. To be fair, most people creating sites on Wix won’t want to place ads on their site. It’s also worth pointing out that Wix Code lets you create your own apps and use APIs. Wix offers a basic plan on a Wix subdomain with Wix branding for free. If you want to connect your own domain, it’s going to cost you. Here are the packages and prices. Like Squarespace, Wix has partnered with Google to offer G Suite for email for an additional charge. Wix is proud of its relationship with Google for search, and I have to give the company good marks on the SEO front. Like Squarespace, Wix has an integration with Google Search Console. But Wix’s integration seems to be more friendly to someone who doesn’t understand search and Search Console. Wix promises instant indexing of your site in Google. While super-fast indexing can be done with Google Search Console, it’s a smart integration that many SMBs will find valuable. Wix extends the functionality of typical website builders with Wix Code. While Wix Code could use some improvements to make it easier to use, the overall site builder will work well for the typical user. Based in the EU, am thinking whether registering a company to handle the buying and selling of domains would make sense. Cons: expenses for accounting, submission of financial statements. Possibly more taxes, depending on country? I love wix. 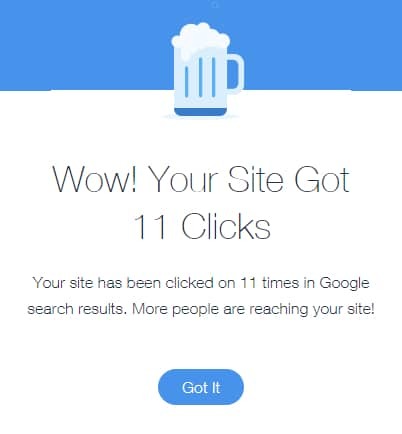 I launched my first blog using wix.com , but the only problem with it is SEO. You need to know SEO for your wix blog to rank in Google and Bing. It is fine for me, but when it comes to businesses Wix is not the website they should choose. Try RedTim.com , I am currently using it and it is not that beautiful as Wix, but it rank the website in Google.